Oh. Hello there. Why yes, as a matter of fact I do still exist. Things have been kind of crazy and hectic around these parts starting this summer and that coincided with me completely losing any motivation to keep up with the blog. Where did I go? Well, we moved, had guests, traveled, traveled, had guests, put on a week-long youth soccer camp, my Grandmother passed away which involved more traveling, traveling again, running a half marathon, and now coaching our middle school soccer team. And last but definitely not least, we found out we were expecting! Which may or may not explain my zero lack of desire to be any where close to the kitchen -- at least for the first 20 weeks or so. The past few weeks I've gotten a little more motivation and we are slowly reverting back to using a weekly meal plan instead of eating out all.the.time. Now that we're closing out our soccer season, hopefully things will get a little easier and we're not rushing around trying to figure out what to eat at 6:30 at night. Which I hate. 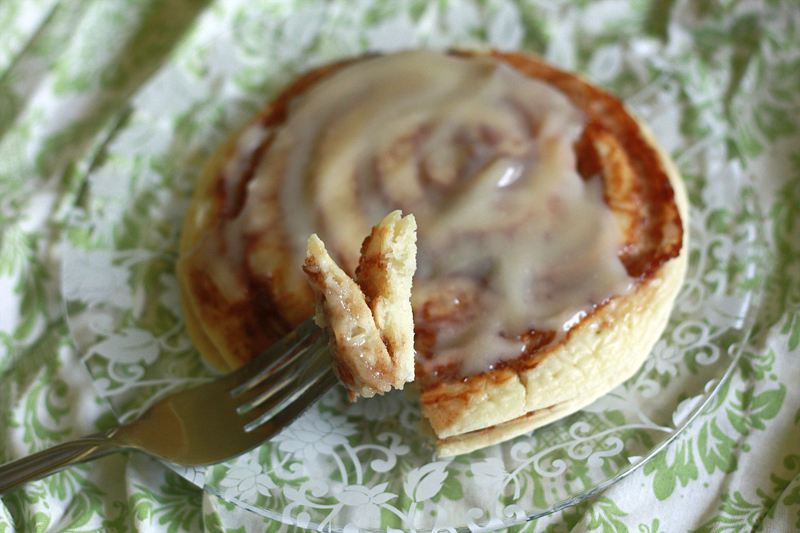 About these Cinnamon Roll Pancakes. Back in the spring, while my parents were visiting, we took them to a local breakfast joint where my mom and I discovered how delicious these could be. I am such a huge fan of regular cinnamon rolls, but the time spent making the dough for them just isn't breakfast friendly. But these? These taste so close to the real thing, without having to wait for all that rising dough nonsense. Preheat griddle or large skillet to medium heat. Combine flour, baking powder, and salt in a medium bowl. Whisk in the milk, egg, and 3 tablespoons butter until all the dry ingredients are moistened. A few small lumps are okay. In a quart-size ziploc bag, add 4 tablespoons butter, brown sugar, and cinnamon. Seal bag, then shake and mix to combine ingredients. Once the griddle is fully heated, coat with non-stick spray. Add about 1/4 cup of batter to the griddle, forming a circle. Snip off a small corner of your ziploc bag. Once the pancake begins to bubble, add the cinnamon filling. 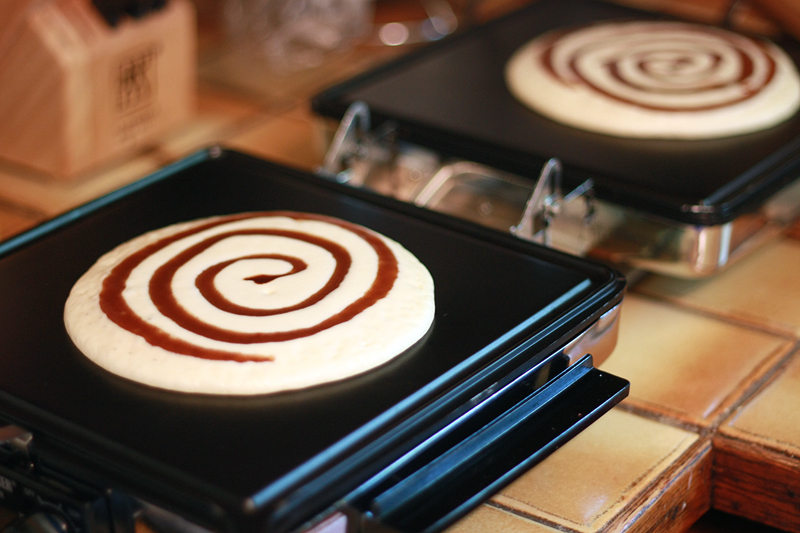 Starting from the middle of the pancake, begin piping a cinnamon filling swirl in larger and larger circles around the pancake, taking care not to get too close to the edge. Flip the pancake over and cook for another 2 minutes, or until the bottom is golden brown. Repeat with remaining batter and filling. While pancakes are cooking, melt the remaining 4 tablespoons of butter in a small saucepan over low heat. Remove from heat and whisk in the cream cheese until smooth. Add the powdered sugar and vanilla extract, whisking until glaze is completely smooth. Top pancakes with cream cheese glaze and serve warm. So totally NOT your healthy "good start" breakfast, but this occasional treat is definitely worth the splurge. 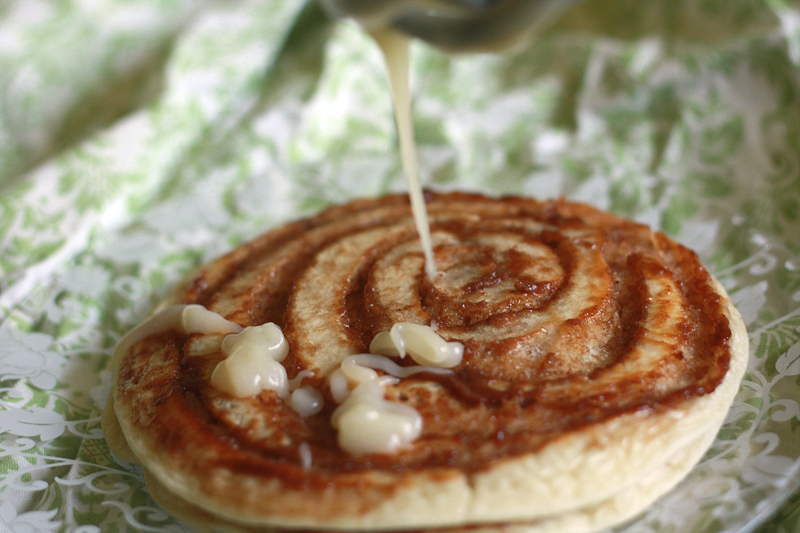 It's just so gooey, and cinnamony, and, and. Awesome. HI!!! So nice to "see" you! :) What a way to come back...yum! !